Managing indoor humidity is important to creating a comfortable, healthy indoor environment. Too much humidity can encourage mold growth and create a cozy home for dust mites and other pests to thrive. High humidity can make you and your wallet uncomfortable too because you'll tend to want the cooling temperature lower than you need for comfort so your system has to work harder to keep up. MICROWELL dehumidifiers are an innovative and working on the principle of condensation, they are removing humid air from swimming pool hall, replacing it with dry and warm air. Their effective performance is proven to be the best in class. They solve humidity problems and maintain healthy environment by removing condensation and providing free heating through heat recovery up to 3,5 times! Microwell heat Pump range has been carefully conceived and redesigned to offer a comprehensive line of heating solutions that can serve any pool size; from small residential pool to hotel or Spa and large leisure centre pools with volume exceeding 400m3. Microwell heat pumps also designed for full year heating of internal and external pools. Microwell has also designed special winter accessories allowing heat pumps to work effectively by -15 deg C.
Efficiency of Microwell heat pumps is proven to be the best. Designed to reach the top results, they are able to extract heat or cold present in ambient environment and leverage it into the pool water. While heating, higher the ambient air temperature is, the more free energy can the heat pump extract operating with high efficiency. At favourable conditions users of Microwell heat pumps pay less than 15% of heat meaning 85% of the heat is free. Dehumidifiers MICROWELL DRY are pool dehumidifiers an innovative and visually attractive solution for indoor pools. They work on the principle of condensation and remove it moist air from the pool and replace it with dry and warm air. Their effective performance proved to be the best in class. They resolve moisture problems and maintain a healthy environment removing condensation and ensuring free heating by heat recovery up to 3.5 times! Designed for drying up buildings, new construction sites, warehouses, as well as non-heated and flooded buildings with high level of humidity. 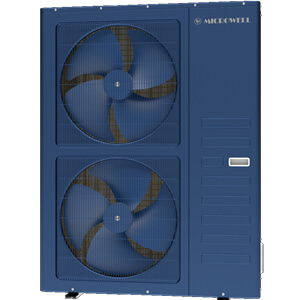 Microwell industrial dehumidifiers ensure powerful and highly efficient humidity extraction. Due to their sturdy metal body and fully mobile design, they are able to deliver required results even in the toughest construction sites, preventing costly damages. With swivel casters, handle and a 2m cable with detachable connector, Microwell industrial dehumidifiers are fully mobile and very easy to work with. Each machine is equipped with easily removed and washable dust filter. On built-in display operating status, working conditions and possible failures are shown. They use automatic defrosting technology, external humidistat on demand and an electric heater (TE models). Maintaining optimal microclimate in museums, galleries, libraries, cultural institutions and other exhibition facilities, containing invaluable exhibition or archived items is quite challenging. Dehumidification in these spaces is essential for the preservation of rare objects, paintings, records, books or documents. Affected by external climate conditions, age and type of construction, as well as a number of visitors and employees exhibition environment must ensure long-term safety and preservation of the collections taking into account specific and often changeable preservation requirements. Microwell DRY GALLERY 300 is a comprehensive solution for managing museum environment. It continuously measures the ambient temperature and humidity level present in the room. Since different collections might have different humidity requirements, DRY GALLERY offers fully adjustable control to meet a variety of relative humidity requirements. The unit is especially quiet and has low vibration levels. Microwell microLIGHT+ is a unique LED technology designed to quickly and accurately measure the level of humidity in any indoor environment. Working on the principle of relative humidity reading, microLIGHT+uses multi-LED light system to transmit gathered information. Gathered values are automatically reflected in colour gradient, are notifying the level of relative microclimate humidity in real time. Microwell microLIGHT+ measures and automatically reflects current relative humidity, changing the colour gradient between blue, green and red colour. Blue LED light indicates a low level of relative humidity, green LED light marks an ideal range of relative humidity, while shiny red LED light indicates a high level of relative humidity present in the room. MicroLIGHT+ is also being designed as a freestanding table lamp that can be placed anywhere in the room. While working as a regular light unit, microLIGHT+ lamp provides the most accurate and safe humidity reading, beneficial for every home environment. After Qmax Tester is connected to swimming pool waterway between heat pump and outlet and water flows through the device, it begins measuring heat pump’s performance. In only a few minutes it delivers detailed measurement. It is equipped with 4’’ digital display, on which 6 different measurements and 8 different values are shown in real time.